A worker putting up a sign for the new UN Assistance Mission in Somalia (UNSOM) Headquarters in Mogadishu. Stressing the importance of the United Nations Assistance Mission in Somalia to that country's political process, the Security Council today extended the mandate of UNSOM's work until 31 March 2017. The 15 members of the Council unanimously adopted an extension of UNSOM's work, underscoring the provision of UN good offices to support the Federal Government's peace and reconciliation process, including preparation for an inclusive, free, fair and transparent electoral process in 2016 and universal elections by 2020. Last month, UN Under-Secretary-General for Political Affairs Jeffrey Feltman and Secretary-General's Special Representative in Somalia Michael Keating, met with President Hassan Sheikh Mohamud and the speaker of the Federal Parliament Mohamed Sheikh Osman Jawari in the Somali capital of Mogadishu. 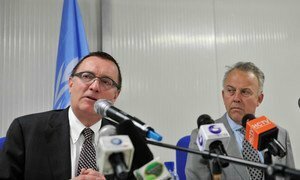 Mr. Feltman reiterated the UN's support to the Somali people for agreeing on an electoral process for this year. In its resolution, the Council encourages UNSOM to enhance its interaction with Somali civil society, including women, youth, business and religious leaders to ensure that different points of view are incorporated in the political process. UNSOM is also asked to conduct a review of the UN presence in Somalia after the elections, to ensure that the UN is properly configured to support the next phase of state-building in the Horn of Africa nation and to present options and recommendations to the Council by the end of January 2017. Included in today's resolution is strong condemnation of recent terrorist attacks by the group Al-Shabaab, and support for a comprehensive approach to reduce the group's threat in accordance with international human rights law, international refugee law and international humanitarian law. The Council also paid tribute to the bravery and sacrifices made by the African Union Mission in Somalia (AMISOM) and the Somali National Army personnel fighting against Al-Shabaab. A senior United Nations official has held talks with Somali leaders in Mogadishu, the capital, in a show of support for last month's “breakthrough” political achievement in selecting an electoral model to be used later this year in efforts to lead the Horn of Africa country out of decades of factional war.